The people who visit Machu Picchu for the first time, end up very impressed by the amazing buildings unique in the planet. But beyond the Inca city of Machu Picchu, the location in which it was built is an impressive and magical mountain environment, whose mysticism and figure is known in every corner of the planet. Between the mountains Machu Picchu and Huayna Picchu form a face looking at the sky. Did you know that when you turn the classic postcard of Machu Picchu, you can see the profile of a human face? Perhaps you have had the opportunity to see in many web pages and blogs, the comparison between the mountains of Machu Picchu and a human face; Some of these images have been greatly manipulated, and presumably this was done with the intention of making this image more like the face of an Indian (or other human being) looking up into the sky. This human profile formed by the mountains Machu Picchu and Huayna Picchu presents a chin, mouth, a somewhat disproportionate nose and a cleft formed by a small depression that gives shape to the eye. It is very curious to see the formation that resembles the mouth, because it seems to be a detail perfected by the mountain itself. 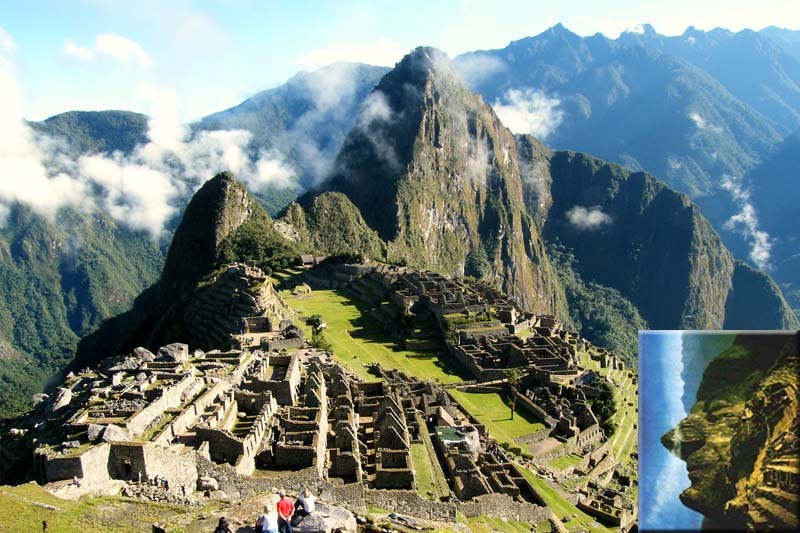 How to see the face in the postcard of Machu Picchu? To see the face in the postcard of Machu Picchu simply turn the postcard to the left. If you make or make the comparison, you can check for yourself that this image does not need any touch-up to identify the profile of a human face facing the sky. The result of this comparison is surprising; If you have the photo turned to the left you can perfectly appreciate the profile of a human looking up. Something very impressive is to think that this was the first vision that the people who entered Machu Picchu by the door of the sun almost 600 years ago and that it is possible to revive the moment, if it decides to enter to Machu Picchu by the “Inca road”. From where can I see the human face of Machu Picchu? If you have already decided when you want to be in Machu Picchu and you want an untouched image of the face that appears in Machu Picchu, you will have to go to the building known as the “guardian’s house”; From this place it is possible to take the image of the classic postcard of Machu Picchu. Some attribute the mysterious profile of Machu Picchu to extraterrestrial beings; These same people consider that the Inca City of Machu Picchu would have been built with the help of these. And although innumerable histories have been woven around the Inca city of Machu Picchu, it is very unlikely that this can be evidenced; In addition, in some cases, these hypotheses show a certain indifference to the “demonstrated” ability of the Incas to work the stone; Although most people will agree that it is just an exuberant whim of nature. Machu Picchu tickets some time in advance. There is no doubt that the city was created with admirable skill by talented Inca engineers and that this should have been a challenge due to its incredible location; However, strange as it may seem, the fact that the Incas built Machu Picchu with the help of aliens continues to be the subject of debate and study, as with the Pyramids of Gizeh, Stonehenge, the Nazca Lines and other fabulous constructions around the world.